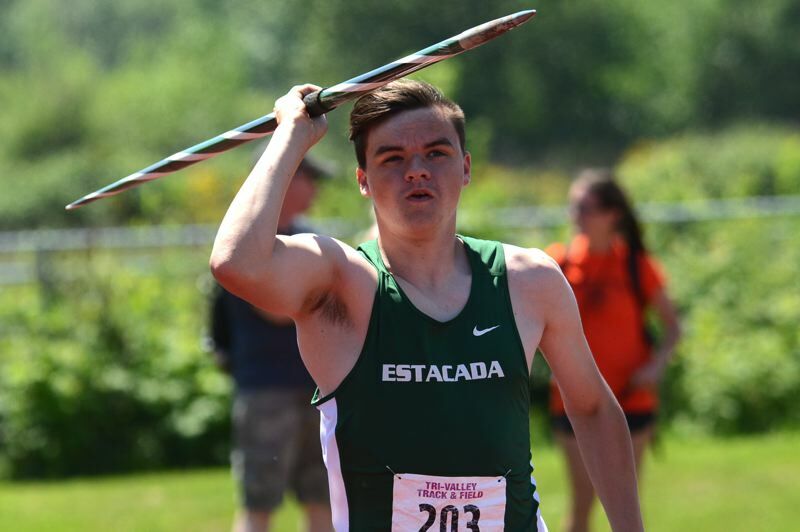 MOLALLA — Estacada junior David Stamm found himself being chased by a pack of guys carrying body length spears Saturday. Fortunately, they were not trying to turn him into a kabob, they were simply trying to beat Stamm's impressive series of tosses at the Tri-Valley Conference district track meet. Stamm took over the top spot on the leader board with a heave of 155 feet, 7 inches on his second attempt and would remain firmly planted at the top throughout the competition. Estacada's Dakota Glover will be joining him at Hayward Field this weekend after finishing second in the 300-meter hurdles with a personal best of 43.08 seconds. Sprinter Justin Kavanagh scored 18 points highlighted by a third-place finish in the 400-meter dash — 0.05 seconds out of second place. His time was good enough to earn him a wildcard spot to state. • The Estacada girls highlighted their day with exchange students Stepanka Erbertova (Czech Republic) and Pia Schwenke (Germany) with a 1-2 finish in the 800. Schwenke and Ebertova joined Rosie Shaver and Cheyenne Kelly to take second in the 1,600 relay at the end of the day. Also advancing to state is senior sprinter Dani New, who held off Corbett's Sarah McMichael for second place in the 200. Look for expanded coverage ahead in our May 17, print edition.